I really don’t use my Crockpot often enough. Usually it sits in the bottom of my cabinet, lurking, until it’s time to make a pulled pork or something else that you must braise unto oblivion, then tear apart and slather with BBQ sauce. The poor Crockpot is misunderstood. It just wants to be loved like the rest of our kitchen appliances. Sure, it has some quirks like the fact that it hates green vegetables and it’s impossible to make a pretty photo of a slow-cooker meal. But it has its merits too. The slow-cooker has magic skill with chicken breasts, too. Most people think only thighs and legs will do well, but when timed right, your chicken breasts will be moist and fall-apart-tender delicious. You may actually need a spoon to get them out of the liner. 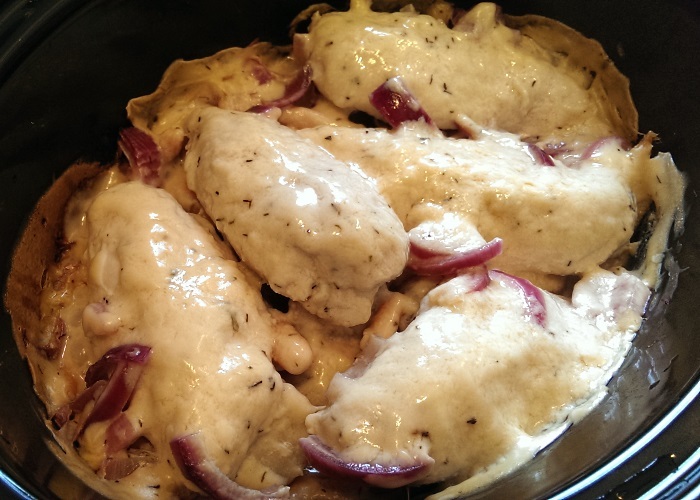 The best part about this Creamy Crockpot Chicken recipe is how it whips together quickly. I can prep it the night before and set the liner in the fridge, ready to pop in the morning before I go off about my day. There’s always plenty of leftovers for days to come, and with the potatoes, onion and carrots cooking below the breasts, all I need to do to make it a complete meal is serve it with a side salad. Place the potatoes, carrots, onions and mushrooms in the bottom of a 5QT slow cooker. Top with the chicken breasts. Combine the seasonings, wine, soy sauce, sour cream and condensed soup until well-mixed. Spoon over the chicken and spread edge-to-edge in the slow cooker. Cook on Low for 10-12 hours or high for 5-6 hours. Sweet Mother of Los Pollos Hermanos! This looks scrumptious! I love my CrockPot and use is quite a bit. When I am in a good meal planning groove, I aim for one slow cooker meal per week. This looks delicious and I love the salad on the side! You have to have something fresh and light with a CrockPot meal in summer! Yum! I have a friend who loves her CrockPot, but refuses to cook potatoes in it for that exact “tastes like brown” reason. You really have to use it in a way that suits you best. There are so many recipes that work well! Yours is obviously one of them. Yum! I’ve never used a crockpot, always wanted one but was afraid the food would get mushy like stew, or soup – and I don’t want that to happen. The way you talked about crockpots makes me want to get one, sooner than later. That chicken looks friggen wicked. Man. I am a chicken breast hoarder. I feel like I waster them in the crock pot. That looks delicious! I love this kind of food as fall approaches 🙂 Looking forward to trying, and I really like your blog Candace!